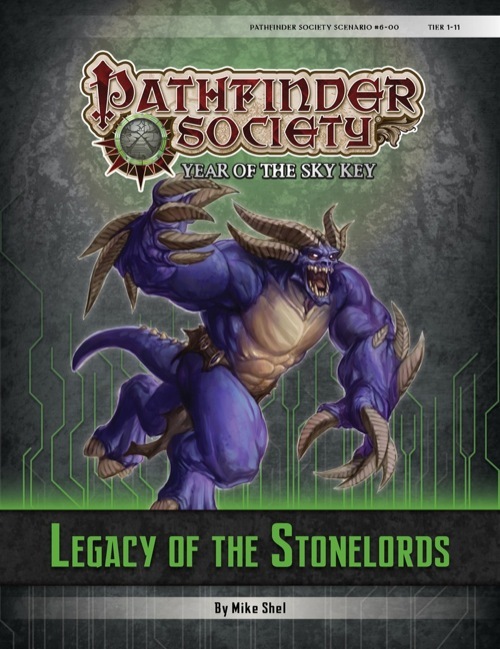 Note: Legacy of the Stonelords is designed for play in the Pathfinder Society Roleplaying Guild. It may be run anywhere by anyone, as long as there are 5 tables playing the scenario simultaneously and are in contact with each other. To inquire about access to this scenario, refer to the Organized Play Convention Support Policy. Similar to Damanta, Ascalaphus and Monkhoud below, I participated in this 8 table special, though I myself was playing at the lowest tier. I think we were also the table with the first player death that event. During the first fight, our level 2 cleric got a little cocky and ate a critical hit of 31 damage, dropping him down to -14 health instantly. Thankfully the GM's took mercy upon our soul and arranged an emergency teleport /raise dead just so he could continue to participate in this event. I doubt we would have been able to get through it all with just a group of 4 players. In hindsight I'd say the death was his own fault, but also that the first encounter was the hardest for us to deal with. That is not to say that the rest of the scenario was a walkover or not challenging; we just realised we were lacking on the damage and tankiness front and debated, in character, on how to deal with that in the future. In the end we settled on using the enviroment in our advantage. We hid in narrow corridors and used my eidolon block the path. Buffing my lovely eidolon to silly amounts of AC meant we had a fighting chance. Or rather: we would not get crushed instantly, but it would still take us a long time to take the enemy down. Given the fact we were also the only table that actually looted the enemy corpses, we ended up with more than enough potions to close our wounds with. While fights were not our strength, we had few problems with the plethora of puzzles. The puzzles themselves were great. There was plenty of variation and luckily we as a party more or less had all our bases covered when it came to knowledge checks. We were rather blessed in that aspect, though the dice often disagreed. It did allow us to come with out-of-the-box suggestions to solve issues, which made the journey rather enjoyable. Then again, the scenery and storyline was simply excellent with a couple of really nice twists thrown in as well. All in all this was a scenario I am extremely proud of to have participated in. There was an amazing amount of diversity in encounters and every character is guaranteed to have a moment to shine. I do think that a party with more brawn than brains will have a slightly easier time overall than a party of know-it-alls, but they will struggle gaining any information about their surroundings. Perhaps they'll even flatout get caught off guard by something evil. Moral of the story: get a balanced party, grab a few drinks and snack, and simply enjoy the amazing ride that is this scenario. This was my first Special and I enjoyed it immensely. I played it as a level 8 Living Monolith at tier 7-8 in the party with Ascalaphus and Damanta (earlier reviews). Adventure, 4: The premise suggests a logical conclusion scenario for season 5. This promise is delivered nicely. Combat, 4: The fights were pretty straightforward, although some monster abilities/spells were quite nasty. Fighting (and obliterating) the tier 10-11 encounter on the stairs felt epic for all of us (although our paladin was a bit disappointed). Background/RP, 5: The way the end of season 5, which has a great Demon- & Jormurdun-focus, mingles with the theme of season 6 is actually nicely done. Needless to say you need to have played #6-01, #6-02 and/or #6-03 first to realize that. All you need to remember is that this is a "Fallen Sky Citadel" in more than one way way. Although the background is great, actual RP sequences are pretty rare. Skills, 4: Quite some tough knowledge skill checks were made, as well as some pretty difficult Disable Device checks. Cuddle and thank your party's Trapfinder if he is succesfull with them. As Ascalaphus mentioned earlier: Ever since character creation, I have enjoyed every time the ability came up. I don't know for the lower tier encounters, but at our tier, this scenario works a lot better if you really work as a team. Having played together before, we knew our strengths and weaknesses and what we had to do. Everyone had a major role which we were willing to fulfill, which gave each of us glorious moments. But in my opinion, if the required skills are poorly represented in a party, you may be in serious trouble. The interaction between the tables was not very interesting, mostly because only a few people seemed to understand how this worked. I advise event overseers/GM's to explain this clearly at the beginning of the adventure. Having run this yesterday (after having also run quite a few specials since way back in 2014), I can safely say this is my favorite special so far. The encounters were challenging for 6 players even at the 10-11 subtier, something I haven't really experienced in specials later than this one. The skill challenges and saving throw difficulties are also much better calibrated than in later specials. And finally, the necessary prep for GMs is also much friendlier than in later specials, especially compared to Siege of Serpents or Cosmic Captive, for which you prep a huge amount of encounters, of which the party will logically only see about a quarter to a third. I played with this with Damanta and Monkhound; I was the paladin. I've previously played Siege of the Diamond City and Year of the Shadow Lodge, and I think Paizo's really getting better at making these. YotSL was chaotic, the interaction between groups was poorly worked out. In SotDS I played at the bottom tier and after beating back the 8th wave of nearly identical critters I was getting rather tired of it. So I was gratified that this special did much better. Interaction between tables: this went smoother than before. I think part of it is the scenario; the big boss fight is set up a bit more plausibly than in YotSL. The Aid token came in very usefully, although we didn't really understand how it was supposed to be used. All we cared about was that it gave us a shot at curing a very nasty curse. I recommend that GMs have a handout with these rules for their table. The combats were what you'd expect, but in a good way; we'd already played 6-01/2/3 earlier, and a lot of season 5, so we were quite ready for them. Even so, they were scary enough to make it exciting. The fights weren't terribly original, but they were a good fit for the place and time. There was some RP here and there, but this isn't a social-heavy scenario. That was to be expected. Earlier in the year I'd found a boon to learn Dwarven. I took the hint and learned Dwarven, since it makes good sense when you're gonna storm a Dwarven ruin. This opened up some more options for our group. There were quite a few puzzles and traps, which rewarded players for being sharp and attentive and bringing the right skillset. I know Monkhound was pretty happy to get to show off just how good his Ranger/Living Monolith was at the skill portion. Proper validation for anyone who's been told that Trapfinding is unimportant. But what sold it for me was that the traps were fairly clever; if all you do is throw dice at them you'll fare badly, but if you think things through it gets much better. The time pressure element worked well for me. The organizers were well aware of it and planned for it. After a certain point you're told "this place is gonna become very unhealthy after X time", but the time is based on how much real-world time is remaining. In that time you want to achieve as many successes as possible, so playing together and playing fast is imperative. It also means that at some point you're like "we have only 15 minutes left before something horrible happens, do we try another side quest or do we run for the exit?" That gave us all a good adrenaline rush. How well this works out depends on how well your organizers plan for it. In the big boss fight, you can fight at your own tier or choose to play up a tier. (It's literally on a sort of stairway, with scarier monsters on each rung. Which lampshades the metagaming very nicely.) If you win at higher tier your successes count for more. We'd been doing fairly well but weren't sure what to do. So like proper cautious Pathfinders we flipped a coin and went up high. That was a pretty furious fight. I think it's good this choice has been put into the scenario. The "big twist" in this scenario isn't the most original thing I've ever seen, but it works very well. It's cliche but it's fun for the players so that's fine. I've said that in a way the scenario isn't super surprising. But that's not the point; it's the climax of a big adventure arc and there's been a lot of foreshadowing about what you'll find there. So the challenge to the writers was to meet all those expectations. To set before you a dungeoncrawl for an army of PCs with worthy foes, a working system for intergroup cooperation, challenges of lore, ingenuity and combat. And the scenario delivers on that. Announced for July and will debut at PaizoCon! Keep in mind that it won't be available for normal purchase until just before Gen Con 2015 but is available for regional conventions. any Clue when we who are GMing it at PaizoCon will get it ? I am setting up PaizoCon GMs' accounts tomorrow to automatically receive it when it is ready. I believe the goal is to have it in your accounts by this Friday evening so you have a full week to prepare. Same question but with GenCon in mind? We aim to get the scenarios to GMs as soon as is feasible. That said, the Friday before the convention weekend is commonly used as our deadline so that GMs have at least a full weekend to prepare. I imagine I'll have more information as we get closer to Gen Con. This is going to be my first ever PFS game, at Paizocon no less! I'm excited to start things off with this! Very much looking forward to prepping this one. I'm another GM who likes to have 3D terrain and minis that are as accurate as possible. Glad to see it added to the download list, even if it's as a soon to be released. It's 7–8 and 10–11, as 9th-level character tend to be more flexible in the challenges they can handle (as opposed to a 7th-level character getting drawn into Subtier 8–9). Will PaizoConUK GM's get it at the same time? As soon as I receive a list from your VC. Hey folks, we're just about to get the PaizoCon playtest version of this Special out the door. There are some rough spots formatting-wise that we didn't quite have time to clean up, but we'll be cleaning those up for Monday. This should still give you plenty to read over this weekend in preparation for PaizoCon. The duergar have a few quirks, such as the fighters not having their enlarge person effect completely accounted for in their stat blocks. The clerics will also get some onyx for certain higher-level spells. I'll be expanding the Knowledge check results in Act 1, so don't worry that there's a little less there than there should be. I have not yet added the Chronicle sheet's boon(s), but yes, they'll be there for PaizoCon. And a handful of some things that need to be bold or italicized. Thanks John. Should we check back beforehand to download and print out updated certs? Yep, that would be best. I'm not sure quite what the system is at PaizoCon, but the HQ for PFS may already be providing Chronicle sheets. I'll let Mike or one of the HQ volunteers confirm. Page 15, tier 10-11: HP total is incorrect for this creature. Should be 184 using the template to arrive at the printed CR. Are the perception DCs for the augur's vapor hazard in the seer's district supposed to be the same before and after? Edit: there doesn't seem to be a map for area E2 either. When can we expect the final version to be available? A week or two before Gen Con. Thanks Mike, but what I meant was the updated version (with the chronicle sheets and updated knowledge checks) that John mentioned would be out on Monday. My mistake for not being clear. I've been holding off on printing this for that reason. I finished up final revisions this morning, so it should be part of the cue to update soon. GMs running this adventure at PaizoCon should now have the revised version of the playtest document. Is the extra PP supposed to apply to this cert, or is it just something for next season? For the second part of the Armorer's District (section A): Do restoration spells heal the ability penalty from the curse trap, at least until the next save occurs? Do they stack? I'm not too familiar with curses. Does making the initial save shake off the curse entirely, like a poison? How are we supposed to run the Augur's Vapors trap in area D2? The perception DCs are the same, is it just 2 perception checks? What happens if the PCs don't make the 'after onset' check? They take damage from an unknown source? What if the players (for some reason) actual listen to the demon in F1 and put on the shackles? Thanks for all the hard work, I'm looking forward to running this! FYI - the "Date download last updated" doesn't appear to have been changed. The date hasn't changed, but the document seems to have been updated regardless. I had an amazing time playing this at Paizocon as a Tier 1. I think I can see what's going to be different at GenCon, and I can't wait to see the reactions here on the boards. It's an exhausting, tough scenario that really brought my table together! Will this be released today? Or tomorrow? It says: "Thu, July 30." Specials are not normally available for purchase until one year after publishing. So the date is actually July 30th, 2015. Is there ANYWAY that someone can stay on top of the release dates. This has caused problems before and now this one is showing it should be released and if someone were to schedule this for a game day even (with 6+ tables) then they would not be able to run this. This is unfortunate as it would be fun to run!! It could potentially screw their schedules up not to mention their potential GM's when they are expecting it. 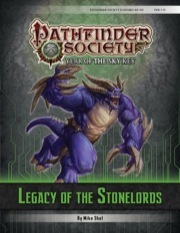 I know this is a Gen Con event as well was it was for Paizo Con.. but it does say it was released Wed, Jul 30th. Will be available for purchase Thu, Jul 30, 2015. Wait, when was that added? Yeah, its something I've long wished they would add, years. It happens every year with the exclusives. They don't include the year and people assume it means the current year when its usually the next year. Mike, I believe they are referring to the tag under the price, which just says month and day. If the tech team can make an adjustment to add the year to that, all confusion will....okay, correction, SHOULD be dispelled. The correction is on their to-do list, but no ETA on it. I'm hopefully running this for a local game day in the middle of next month. If it doesn't cause too many spoilers, could someone post which, if any, map packs/flip mats are used? Need to buy them early to get them shipped all the way to Aus. This post is where John Compton posted the list. Although it's since been edited and you no longer need the Cathedral flip mat. Does anyone remember what the special replay rules were for the piazocon playtest vs the final product? Just realised I have both chronicles on the same character and don't recall if we were allowed to do this. You can replay or receive a second GM credit for the final updated special if you played or GMed the playtest version respectively. You still cannot apply the credit to the same character however.